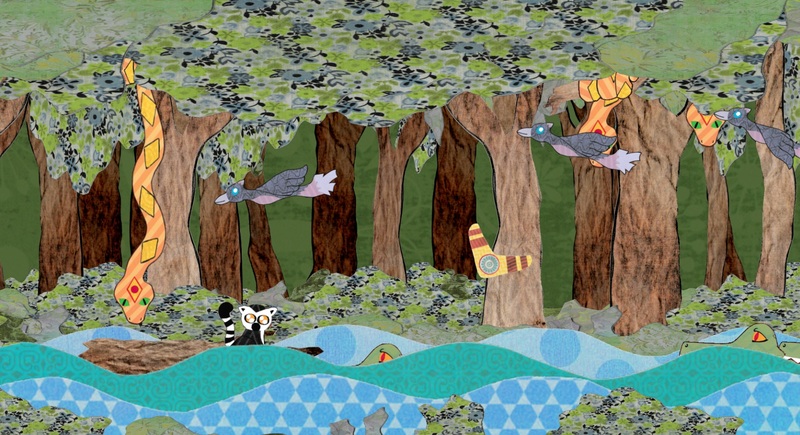 Navigate the rapids on a log avoiding crocodiles, snakes and birds with your boomerang as your only defense. Your Boomerang is your "One Shot" at a time, so beware, if it is lost, you will have complete your journey without it! Featuring hand-cut papercraft graphics and original music! Me and my team are honored by your feedback! This was our first contest, and my wife's first time helping with one of my games. She made all of the visual artwork out of construction paper, and we scanned it in. Thanks for your involvement in GM48! I'm impressed with the art quality of this game! (visual and music) I loved it! I think the gameplay could use some polish (it is not that fluid, although it matches the aesthetic, I think the movement could be more loose), but it is fun anyway. Congratulations, great job! Soooo... once you get the boomerang stuck in the trees, you can't get it back anymore? Uh. Fortunately, I don't need it. All I need to do is jump on the front of the trunk whenever I get hit and voilà, I beat the game. I like what you did with the graphics, but it's a bit... inconsistant. The water looks pretty good especially the piece with low contrast. I think it would have looked better if the rest was like this cause the fact that these are "piece of papers" is unique on its own it doesn't need over complicated patterns. The trees for instance, no offense but they don't look pretty good... I think 2 shades were more than enough for each elements (talking about the paper sheets). If it looks good and simple, no need to make it more complicated. Sometimes, adding more details just kills it. Thanks for the feedback! The boomerang does get stuck on the snake's branches, but you can jump and retrieve it before it leaves the screen. I hope you had fun testing! Both the artstyle and the music were awesome and original, I liked the way knockback was your hp system, but the player is basically unkillable thanks to iframes and jumping forward (I would've either made the invincibility time shorter or made an actual hp system in addition to the knockback one). The level was pretty nice, with different enemies that kept you moving in all directions, and I'd say overall my only complaint is how the boomerang worked, I liked how it looped back through the screen, and that you had to catch it if it fell in the water, but the way the angle is choosen seems a bit counter-intuitive, and it shouldn't automatically shoot when it gets to 90 degrees. Other than that this game was really fun to play. I like the art style, very unique! I had trouble aiming with the boomerang, but still enjoyed playing just dodging as much as possible. That boomerang is the bane of my existence. Nice job! Art and music is top notch stuff. Once I lost my boomerang the game was almost easier. I just focused on jumping the obstacles and making sure I was mostly on the log. But nice job overall! Love the art! Music fits well. Like the sounds. My only qualm is that it isn't super obvious how the boomerang works. It says aim with the mouse, but the angle actually seems to be determined by how long you hold down the spacebar. Technical note: Somehow on my first run, I managed to start the game with the Rainforest Rapids Text still in the frame. Thanks, glad you enjoyed it! I'm not sure where you saw anything about aiming with the mouse. The title screen says "Hold SPACE to aim," which was our control scheme from the beginning. Yeah, sadly we noticed the bug with the title staying in frame just minutes before the deadline. I managed to get rid of my lovely boomerang somehow but hopefully managed to get safely to the end. I like the style of art and the "jungle" music also fits very well. Nice work! Well done! It's not easy once you lose your boomerang. Yeah, the boomerang is supposed to get stuck in the trees when you use it to knock snakes down out of the trees instead of hitting them in the head. We had hoped to make that more obvious, but it didn't happen in the time allotted. Thanks for playing! I quite like the art style you went for here and the music had the right feeling to it too. I think the boomerang is a great "one shot" weapon, though I don't know if this made the most of its possibilities. The variety of enemies did allow you to use the boomerang in a few slightly different ways, which was good. Maybe some collectables (e.g. coins) would allow you to make better use of the boomerang's return capability. There is a slight bug that the title text can get stuck partially on the screen if you boomerang straight away to the Easy mode option (I played HTML5 build). Thanks! We took the theme to mean One Shot at a time, so the Boomerang is the single resource that needs to be retrieved before it can be used again. Armed with a single boomerang a lost baby lemur must brave the dangers of the rainforest to reunite with his family at the river’s end.